1. Heat a griddle pan over a medium-high heat. Mix the garlic with 1 tsp olive oil and use to coat the steaks. Season and griddle the steaks for 2 minutes on each side for medium rare. Set aside to rest. 2. Meanwhile, in a small saucepan, boil the orange juice until reduced by half. Remove from the heat and stir in the vinegar, mustard and 1 tsp oil; season and set aside. 3. In a bowl, toss the red onion and white chicory with the remaining olive oil and season. Griddle for 1 - 2 minutes on each side (you may need to do this in 2 batches). 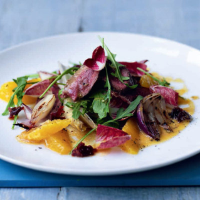 Toss with the red chicory, rocket, orange segments and warm dressing. 4. Slice the steaks and serve with the warm salad, scattering the cherries over the top.